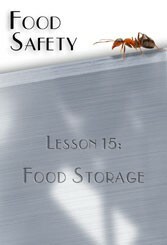 This video contains 13 general rules for storing food as well as another 24 tips for storing cold, frozen, dried and canned food correctly. It also addresses the importance of stock rotation and the rules for using single use items. 5 minutes.